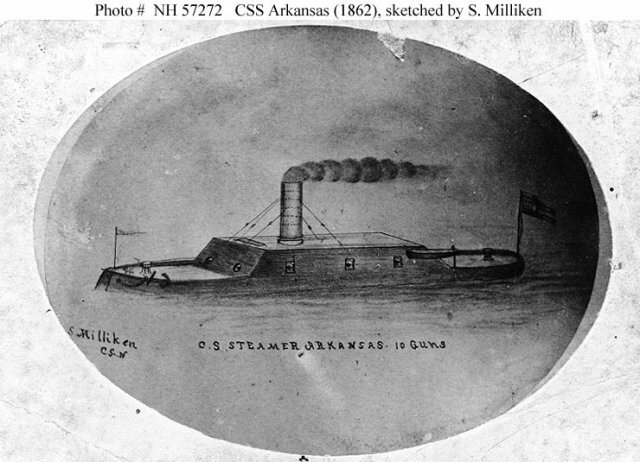 CSS Arkansas, an ironclad ram, was built at Memphis, Tennessee, in 1861-62. Incomplete when Union forces closed in on Memphis in May 1862, she was towed up the Yazoo River to Yazoo City, Mississippi, and finished as far as circumstances allowed. On 15 July 1862, her enterprising commanding officer, Lieutenant Isaac Newton Brown, CSN, took Arkansas down the Yazoo, where she encountered the U.S. gunboats Carondelet and Tyler and the ram Queen of the West, leaving the first two badly damaged. 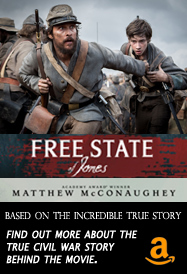 Continuing out into the Mississippi River, she boldly fought her way through the assembled Federal fleet and came to rest under the protection of the Confederate fortress at Vicksburg. While at Vicksburg on 22 July, Arkansas was attacked by the Queen of the West and ironclad Essex, but was not severely damaged. Though badly in need of repairs, she was next ordered to steam down the river to assist Confederate forces in an attack on Baton Rouge, Louisiana. While carrying out this mission on 6 August 1862, CSS Arkansas suffered a severe machinery breakdown during an engagement with the Essex, drifted ashore and was burned to prevent capture. This page features views of CSS Arkansas and provides a link to images of that ship's actions. 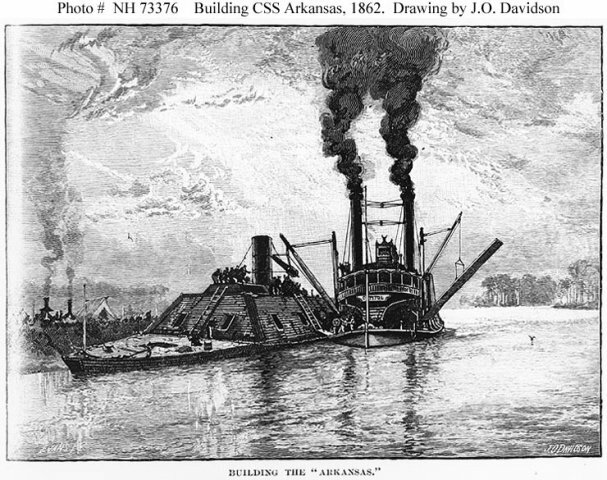 CSS Arkansas (1862-1862) -- Actions and Activities. Sepia wash drawing by R.G. Skerrett, 1904. Courtesy of the Navy Art Collection, Washington, DC. 19th Century photograph of a sketch by S. Milliken, CSN. Line engraving after a drawing by J.O. Davidson, published in "Battles and Leaders of the Civil War", Volume III, page 573, depicting the ship fitting out off Yazoo City, Mississippi, in June-July 1862. Assisting in the work is the CSS Capitol.